Rowell, the hugely popular author of books for young adults and adults shares the story of her latest YA novel, described as a ghost story, a love story, and a mystery. The book is a bit of a departure for Ms. Rowell, but relates to the characters in the beloved Fangirl. Tickets are available starting October 6 at The Book Stall. Call us at 847 446-8880 for details. 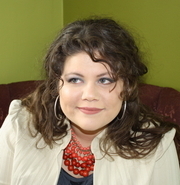 HUDSON VALLEY YA SOCIETY: Rainbow Rowell - "Landline"
Author RAINBOW ROWELL writes books. Sometimes she writes about adults (Attachments and Landline). Sometimes she writes about teenagers (ELEANOR & PARK and Fangirl). But she always writes about people who talk a lot. And people who feel like they're screwing up. And people who fall in love. When she's not writing, Rainbow is reading comic books, planning Disney World trips and arguing about things that don't really matter in the big scheme of things. Rainbow lives in Nebraska with her husband and two sons. Spend the Summer of 2014 Reading Rainbow Rowell with Left Bank Books! We'll meet on the 3rd Wednesday of May, June, July & August & we're going to meet twice on those days: once at noon and once at 7:30pm. The group will gather downstairs in the Central West End store. Please RSVP to Jonesey at jonesey@left-bank.com or call 314-367-6731 if you're interested. This month we're reading Landline: Georgie McCool knows her marriage is in trouble. Two days before they're supposed to visit her husband, Neil's, family for Christmas, Georgie tells Neal she can't go. When her husband and kids leave for the airport, George wonders if she's finally ruined everything. But when she discovers a way to communicate with Neal in the past, Georgie feels like she's been given an opportunity to fix her marriage before it starts. This month’s teen book club will read Eleanor & Park, an award-winning novel by Rainbow Rowell. Set over the course of one school year in 1986, this stunning debut tells thestory of two star-crossed misfits falling in love for the first time. This month we're reading Attachments: Beth and Jennifer's company monitors their office e-mail. Lincoln is supposed to turn people in for misusing company e-mail, but he can't bring himself to crack down on Beth and Jennifer. By the time Lincoln realizes he's falling for Beth, it's too late for him to ever introduce himself. The KnitWits Reading Group will meet at Common Thread on July 16 at 6:30 pm to discuss Eleanor and Park by Rainbow Rowell. The New York Times bestselling author will be signing copies of her highly acclaimed novels, Fangirl and Eleanor & Park. For further information please contact the shop. This month we're reading Fangirl: Cath and her twin sister, Wren, ensconced themselves in the Simon Snow series when they were kids; it's what got them through their mother leaving. Wren has mostly grown away from fandom, but Cath can't let go. Now that they're going to college, Wren has told Cath she doesn't want to be roommates, and Cath is on her own, completely outside her comfort zone. Fangirl is a coming-of-age tale of family, first love, and fanfiction. This month we're reading Eleanor & Park: Set over the course of one school year in 1986, this stunning debut tells the story of two star-crossed misfits falling in love for the first time - smart enough to know that first love almost never lasts, but brave and desperate enough to try. The YOUNG@HEART BOOK CLUB will hold their meeting at Rigolo Cafe this month to discuss Eleanor & Park by Rainbow Rowell. Rainbow Rowell is currently considered a "single author." If one or more works are by a distinct, homonymous authors, go ahead and split the author. Rainbow Rowell is composed of 2 names. You can examine and separate out names.